An optical boutique will be opening in the new Snowmass Base Village just in time for the 2019-20 winter season. Eye Pieces of Snowmass will be located on the plaza level of One Snowmass offering a collection of the finest designer and sports eyewear. Eye Pieces, a Colorado-based company, brings with it over 35 years of optical experience to the Base Village. Founded in the mountains of Colorado in 1984, by an avid skier and second generation optician, Eye Pieces is excited to add a sixth location in Snowmass. From designer frames and prescription lenses to high-performance sports frames, goggles and ski helmets, Eye Pieces curates a one-of-a-kind collection of eyewear. 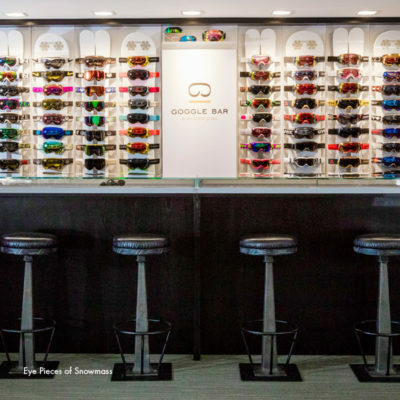 Eye Pieces is famous for their Goggle Bar, outfitting athletes from the neck up for their day on the slopes. Years ago, they teamed up with Smith Sports Optics and developed a prescription goggle, to address the challenges people face with obtaining clear, sharp vision while on the mountain. Their opticians are experts in integrating the best gear in the snow sports industry with audio accessories and turbofan technology to ensure visibility throughout the day. Now owners in One Snowmass, locals and visitors alike will have easy access to the best eyewear trends and prescription services while taking their mountain vacations. To receive more news and updates about living in One Snowmass, the Base Village’s newest ski-in/ski-out residences email us or call us at 970-924-9100.